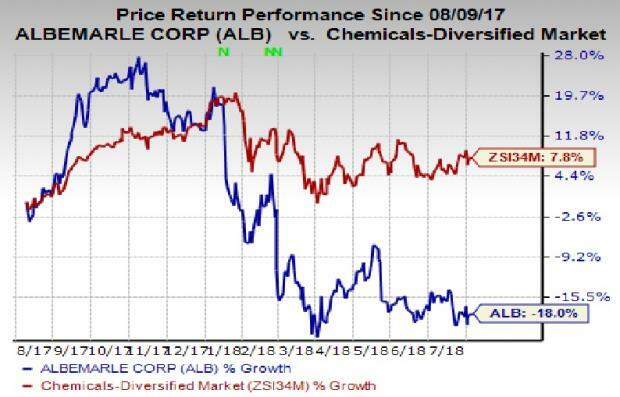 Albemarle Corporation ALB saw its profits jump in the second quarter of 2018 on the back of strong gains in its Lithium unit. The chemical maker posted a profit of $302.5 million, or $2.73 per share in the quarter, a roughly three-fold surge from a profit of $103.3 million or 92 cents per a year ago. The bottom line in the reported quarter was also boosted by gains on divestment of the polyolefin catalysts and components portion of the Performance Catalyst Solutions (“PCS”) business. Barring one-time items, adjusted earnings for the reported quarter were $1.36 per share, topping the Zacks Consensus Estimate of $1.28. Revenues rose around 16% year over year to $853.9 million in the reported quarter. It also surpassed the Zacks Consensus Estimate of $799.5 million. Sales in the quarter were aided by higher volumes and pricing as well as favorable currency impacts across the company’s businesses. Sales from the Lithium unit jumped around 30% year over year to $317.6 million in the reported quarter, supported by favorable pricing, higher sales volumes and favorable currency impacts. Adjusted EBITDA climbed roughly 23% year over year to $141.6 million. The Bromine Specialties segment raked in sales of $220.5 million, up around 8% year over year, driven by favorable pricing, higher volumes and currency impacts. Adjusted EBITDA was $69.4 million, up around 12% year over year. The Catalysts unit reported revenues of $285 million in the reported quarter, up roughly 10% year over year. The division’s sales were supported by higher volumes, favorable pricing and positive currency impacts. Adjusted EBITDA was $75.1 million, up roughly 11% year over year. Albemarle ended the quarter with cash and cash equivalents of roughly $908.1 million, down roughly 10% year over year. Long-term debt was $1,406.7 million, down around 1% year over year. Cash flow from operations was roughly $223.9 million for the first half of 2018, compared with cash outflow from operations of around $54.5 million for the same period a year ago. Capital expenditures were $280.9 million for the first half, up from $97.8 million a year ago. Albemarle raised its adjusted earnings per share outlook for 2018. The company now sees adjusted earnings for the year to be in the band of $5.30-$5.50 per share (up from earlier view of $5.10-$5.40), a year-over-year increase of 15%-20%. The company now envisions net sales for 2018 to be between $3.3 billion and $3.5 billion, up from $3.2 billion and $3.4 billion it expected earlier. Adjusted EBITDA for the year has been forecast in the range of $990 million to $1,020 million. Albemarle’s shares have lost around 18% over a year against the roughly 7.8% growth recorded by its industry. Albemarle currently carries a Zacks Rank #2 (Buy). Other top-ranked stocks worth considering in the basic materials space include KMG Chemicals, Inc. KMG, Ingevity Corporation NGVT and Celanese Corporation CE each carrying a Zacks Rank #1 (Strong Buy). You can see the complete list of today’s Zacks #1 Rank stocks here. KMG Chemicals has an expected long-term earnings growth rate of 28.5%. Its shares have gained roughly 41% over a year. Ingevity has an expected long-term earnings growth rate of 12%. The company’s shares have rallied around 68% in a year. Celanese has an expected long-term earnings growth rate of 10%. Its shares have shot up roughly 19% over a year.